Camp Erin is a weekend, overnight camp, for kids ages 6 -17, who have experienced the death of someone close to them. It is a weekend-long experience filled with traditional, fun, camp activities combined with grief education and emotional support – facilitated by grief professionals and trained volunteers from the Willow Center and the community. The goal of Camp Erin is to provide a supportive and caring environment for children and teens affected by the loss of a loved one. Fun, recreational activities are designed to help campers deal with their grief and develop coping skills. Children grieve in many ways. They require physical activity as well as emotional outlets. Camp Erin provides a safe place where children can grieve with others who have been through a similar experience. Through a grant from The Moyer Foundation, generous donations from the community and the help of 55-60 volunteers, Camp Erin is FREE to all campers! Camp Erin 2019 is July 19th – July 21st, 2019. On Sunday, parents arrive onsite at 1:00pm for debriefing with our volunteers, then reunite with their kids and everyone participates in the short closing ceremony is at 2:30pm. All campers and families leave immediately following. The camp is held at Camp Wooten Environmental Learning Center, a Washington State Park facility located in the Blue Mountains south of Pomeroy. Camp Erin is named in memory of Erin Metcalf, who developed liver cancer at the age of 15. Karen and Jamie Moyer, founders of The Moyer Foundation, met Erin during Spring Training in 1998, and they developed a special friendship with Erin and her family. Because Erin had such a desire to help other children, the Moyers felt that a grief camp for children would be an appropriate tribute to her. The Moyer Foundation was established in July 2000 by Major League All-Star pitcher Jamie Moyer and his wife, Karen. The Foundation’s mission is to provide comfort and support to children and families enduring a time of profound physical, emotional or financial distress.Camp Erin is the Foundation’s largest and furthest reaching initiative. The Moyer Foundation partners with healthcare and bereavement organizations in local communities to help fund, develop and grow Camp Erin nationwide. For more information visit www.moyerfoundation.org. If you’re ready to get started as a camper, make sure to checkout our Camper Registration letter for more information. If you’re a new or returning volunteer, make sure to read our volunteer letter for more information. Like us on Facebook and Watch a video of highlights from a previous Camp Erin. 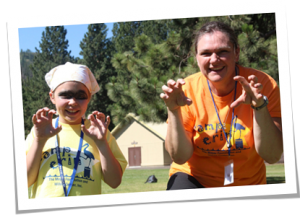 Camp Erin of the Lewis-Clark Valley is operated by the Willow Center, Inc., a nonprofit 501(c) (3) organization.